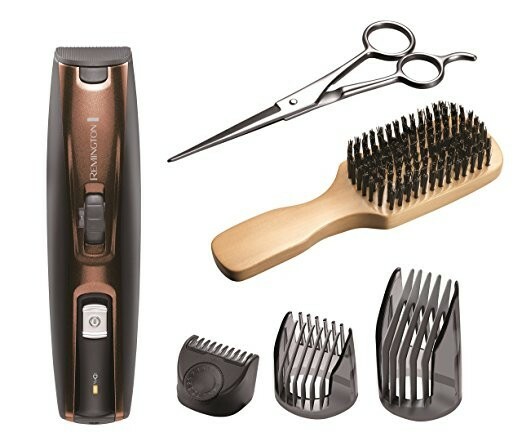 The Trimmer comes with the Titanium Coated Self Sharpening Blades which are long lasting and gives you a perfect trim. Secondly, the Trimmer comes with the Lithium Battery which gives you a smashing 2 hours run time on a charge of 4 hours. All the stuff that comes with the kit comes really handy while grooming and styling your beard and ultimately makes it an easier task while keeping in mind not to drill a hole in your wallet. The pop-up trimmer is just perfect for detailing, especially your sideburns and moustache. Also, the trimmer head is completely washable thus making the kit easy to clean and maintain. Now that we have talked about the product so much, let’s sum up its pros and cons. Titanium Coated Blades for durability. Self-Sharpening Blades for a perfect trim. Lithium Battery which gives you a run time of 2 hours on a 4 hours charge. Completely washable trimmer head for easy cleaning and maintenance. A pair of Premium Stainless Steel Scissors for customised styling. A Mixed Boar Bristle Brush for the perfect grooming of the beard. Three adjustable combs for all beard sizes. Cordless usage for more versatility. It can get a bit loud compared to other trimmers in the market. Finally, I would like to say that it is a perfect grooming kit in this price range and if a bit loud sound isn’t a big deal for you, then definitely go for it. I guess this product will suit everybody’s beard and grooming needs and would be a perfect Bang for your Bucks!!! We prefer the Philips Series 3000 Beard Trimmer QT4013/23 not to be confused with the 3000 kit 7 in 1 kit! The main issues with this shaver are this would be ok for those who are not so interested in precision length as this doesn't do that well. It does remove hair fast however.